Way back in 2006, some funny/disturbing, decades-old outtakes of an ill-tempered man named Jack Rebney shilling for recreational vehicles took on a life of their own as a widely-circulated viral video popularly known as “Winnebago Man.” While Rebney’s impassioned tirades eventually inspired a full-length follow-up documentary in 2009, the original meltdown montage is obviously still providing inspiration to viewers across the county, as evidenced by “Wilco Kitty Man,” a clever and affectionate new promotional video from the Williamson County Regional Animal Shelter in Georgetown, TX. 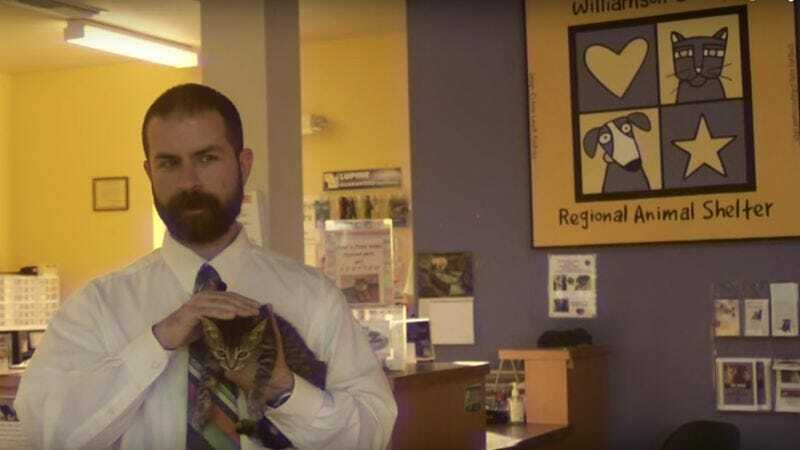 In its efforts to get people to adopt some adorable kittens, the shelter has employed its own hotheaded, Rebney-type spokesman to make an appeal to the public, although this one is considerably more sedate and less profane than the original. The shelter is giving away free cats and kittens on September 26 and 27 from 11 a.m. to 5 p.m., and this is their way of bringing attention to the event. Perhaps they hadn’t seen any of Saturday Night Live’s more-recent cat adoption sketches.